Back in 2013, during the same July weekend of when R.I.P.D. and Red 2 were released, director James Wan released the supernatural horror film titled The Conjuring. In a nutshell, the film, which starred Patrick Wilson and Vera Farmiga, follows the Warrens (Ed and Lorraine), who are paranormal investigators that come to assist the Perron family and their farmhouse, which has been experiencing increasingly disturbing events in Rhode Island in 1971. The Conjuring, which was inspired by the real-life reports of the Amityville Horror story, received positive review from both fans and critics, grossing over $319 million at the box office against its low production budget of $20 million. Due to its success, a spin-off movie was greenlit and in 2014 the film Annabelle was released (roughly a year after The Conjuring came out. Set within the same cinematic universe as the first film, Annabelle focused on the Forms (Mia and John) on how they come across the “possessed” doll named Annabelle (the same doll that was briefly mentioned in the first film). Unlike The Conjuring, Annabelle was faced with mixed reviews, but did, however, rake in roughly $257 million at the box office against its $6.5 million production budget. Given the success of both films, two sequels were granted, with The Conjuring 2 being released in 2016 and Annabelle: Creation being released in 2017; each one taking their respective narratives into a different direction (i.e. one continuing the story forward, while the other explaining more of the origin). Because of this, The Conjuring has built a shared cinematic universe, weaving in different stories and characters that are connected together (something that hasn’t really been tackled in the horror genre). Now, Warner Bros. Pictures (New Line Cinema) and director Corin Hardy present the fifth installment in the The Conjuring franchise with the movie The Nun; a prequel spin-off to the 2016 Conjuring 2 feature. Is the origin tale of “the nun” the “darkest chapter” in this cinematic saga or is just an inconsistent and even entry in The Conjuring franchise? In 1952, a nun commits suicide at a remote Abbey in the heart of Romania and the Vatican wants to know the reasons and machinations on why such a person of the faith would follow through with a vile sin. The Church then dispatches Father Burke (Demián Bichir), a priest who specializes in the supernatural (called a “miracle hunter”), pairing him with Sister Irene (Taissa Farmiga), a young novitiate who’s just about to take her vows (preparing for a life of service to God and the Catholic faith). Together, the two travel to Romania, being greeted by Frenchie (Jonas Bloquet), a local who acts their guide and the one who discovered the of the body of the dead nun, as they make their way to St. Cârța Abbey, an ancient monastery who the local townspeople believe to cursed. Working their way around the ominous abbey, Father Burke and Sister Irene begin their investigation, questioning some of the reclusive nuns that dwell there, witness the growing madness and fear of a primordial entity; a demonic being named Valak (Bonnie Aarons), who lurks in the shadows, murdering those who dare to confront the abbey’s terrible secrets. I’ve stated multiple times on my blog review posts that I’m not the hugest fan of horror flicks. I would never discredit anyone (be it cinephile / movie buff or causal moviegoer) who finds a special interest with the genre, but it really isn’t my “cup of tea” sort of speak. However, I have recently seeing some horror flicks or those that of which have been “labeled” as horrors of some variations with that element genre, including Crimson Peak (a gothic horror), It Comes at Night (a suspenseful drama / horror), and 2017’s IT (drama horror), which is probably my favorite horror flick so far. So…who knows…. maybe I should start watching a few more horror films out there. Since the horror genre isn’t part of my regular “favorite” movie genres, I really haven’t seeing any of The Conjuring movies out there. I’ve heard plenty about them, seeing the trailers for all the films, and heard how scary the films were, but I just never checked them out (prior to seeing The Nun). As a side-note, I do find it interesting that there making up a sort of cinematic universe with The Conjuring films and how it all sort of “interconnected” (yes, I’ve read a brief summary online of The Conjuring movies). So, yes…I know a little about The Warrens, April’s music box, and Anabelle doll. This, of course, brings me to talking about The Nun, the latest horror flick within The Conjuring universe. It goes without saying that I’ve seeing many of the advisements for The Conjuring movies throughout the years, especially their movie trailers (in theaters) or TV spots. So, I know it’s a proven horror franchise for many of the current moviegoers, which is why they (the studio hivemind) are trying to create an established movie universe with The Conjuring features. Since I don’t follow the movies, I really particular look for much info and “pre-release” buzz about the movie via the internet. However, I do remember seeing the film’s trailer several times when I go to the movies (for my weekly theater outing). While it looks scary and promising a lot of terror-filled moments, I was kind of interested to see it, especially how the character of “the Nun” looks like and how the film promises to show her “origin tale” and how it will (presumably) connect to The Conjuring movies. So…. trying to expand my “movie critic horizons” I decided to purchase a ticket to see The Nun (plus a few of my co-workers were going to see, so went with them). However, while I mentioned above that I haven’t seeing any of the movies in this horror cinematic universe, I actually did watch The Conjuring and The Conjuring 2 after watching The Nun, which is why I delayed my review (to see those two films before writing this review). So, I do have a little bit more “insight” into The Conjuring Universe now (still haven’t seeing the two Annabelle movies, so I’ll have to check them out as well sometime soon). Anyways, back to The Nun. What did I think of it? Well, to be honest, I kind of liked it. While it’s not exactly perfect and struggles within its some thinly-sketched narrative pieces, The Nun is good addition to the ever-growing Conjuring cinematic universe. The Nun is directed by Corin Hardy, whose previous directional projects include the short film In the Back and the feature movie The Hallow. While director James Wan helmed the two Conjuring movies, Hardy makes for the third outside director for this feature (i.e. the first being John R. Leonetti for Annabelle and the second being David F. Sandberg for Annabelle: Creation) and effectively does fairly good job in making his own personal “mark” on this horror cinematic universe. Of all the creatures in The Conjuring Universe (i.e. Bathsheba, Annabelle, The Crooked Man, and Valak), Valak (to me) seems like the “creepiest” one, especially given the fact this demonic entity is personified (physically) as a nun (someone who is suppose to be holy / pure of the Catholic faith). Something about that gives me chills and I suspect that most will agree with me on that. To his credit, Hardy does make The Nun (from onset to conclusion) feels like something different from the other four films in the franchise. Perhaps the reason for this is the actually setting and location of the film’s time place and time period. While the other films have a familiar setting of a house or an apartment (with some modern amenities and nuances here and there), The Nun, which takes place 1952, is set in a very remote location in the heart of Romania and in a medieval castle / monastery. Thus, the whole film has that “medieval / gothic” feel throughout, which is a nice change of pace for the franchise. Hardy utilizes that notion and does come up with some very creative and cinematic scenes throughout the movie, drumming up plenty of “atmospheric” and “creepy”, be it just scenery locations or some horror filled moments. Even better is the fact that Hardy makes The Nun feel like its own thing (i.e. a standalone feature). Yes, it is part of the Conjuring Universe and does have the little “Easter Egg” bits that help connect it to its larger cinematic world, but it is also a straightforward narrative piece that’s accessible for any moviegoer (be it longtime fan of the franchise or newbie…like I was). In a nutshell, Hardy’s direction is (for the most part) pretty good, effectively making The Nun a fun / entertaining horror feature (at least I thought so). On its technical merits, The Nun truly does shine, elevating some of the movies negative points (more on the below) to bring to life such an atmospheric horror endeavor that works and works fantastic. It must be mentioned that majority (if not all) of the movie was actually filmed in Romania (in the surrounding areas of Bucharest and Transylvania) and definitely looks authentic throughout the movie. I was definitely loving the whole medieval / gothic backdrop in The Nun and it certainly has an extra layer of quality to the movie in giving the whole St. Cârța Monastery castle and sense of eerie foreboding (as if you don’t know what mysterious beings / entity is lurking in its ancient halls and corridors. It’s also like the movie’s setting is its own character, which is actually a really good thing for a movie to pull off. 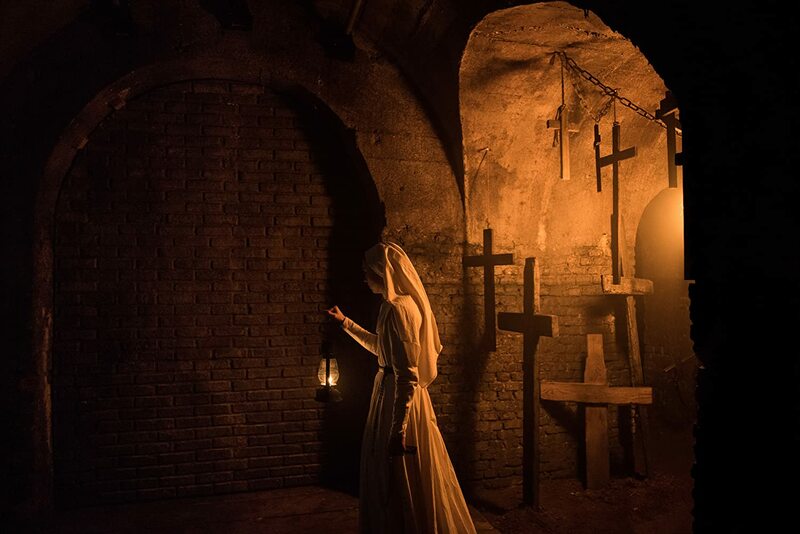 Thus, the efforts made by Jennifer Spence (production design), Gina Calin (set decorations), and Adrian Curela and Vraciu Eduard Daniel (art direction) should be mentioned in bringing such a great set piece setting to life in The Nun. Another person that should be mentioned is Maxime Alexandre, who provides some excellent cinematography work on the project with heavy usage of fog and camera lighting and movement to create some bone-chilling yet creatively sequences scattered throughout. Again, The Nun is very much a gothic horror / atmospheric horror feature. There’s also the entire make-up department, who should be applauded for their efforts in the movie, especially when it concerns in applying the make-up for The Nun (definitely some great make-up work on her throughout the entire film. Even the film’s musical score, which was composed by Abel Korzeniowski, is pretty great, layering some horror / intense-filled moments with his music as well as some very ominous “mood” melodies here and there, especially whenever “The Nun” is on-screen. All of these contributing cinematic nuances and technical presentation make The Nun feel like a true gothic horror feature, which is good thing. Unfortunately, The Nun does have obstacles in its way that either Hardy nor the film itself can’t overcome; resulting in the feature being a mediocre endeavor in the whole “grand scheme” of this cinematic universe. While I mentioned that I’ve seeing the two Conjuring movies, I haven’t seeing both Annabelle or Annabelle: Creation. Thus, I really can’t compare this one to those two movies. That being said, in comparison to the two Conjuring features, The Nun doesn’t quite reach that special “it” factor that those movies were able to achieve. Why? Let me explain. Perhaps the most notable thing is that the story. Yes, while mentioned that the story of “the Nun” (or Valak) is the primarily telling, with the demonic being haunted and terrorizing the people inside St. Cârța Monastery, the problem is that it needs more substance surrounding a lot of the events that transpire within those ancient hallowed halls. The film’s script, which was penned by Gary Dauberman (who by the way wrote the screenplay for the two Annabelle movies) and with a story written by Dauberman and The Conjuring director James Wan, is probably where the movie is the weakest. Again, the story is there and it is pretty solid for a horror movie (especially one with this shared movie universe), but Dauberman’s script is handled rather clunky, with less interest in its characters builds and narrative substance and more interested in scary “horror” thrills. An example of this is the film is in the movie’s idealistic / thematic material of faith and battling against the darkness. Given the feature’s setting, the time period, and a demon nun, something of a person’s faith and the perpetual balance of light and dark (i.e. good and evil) should’ve been a more paramount figure in The Nun and could’ve help strengthen the narrative being told. Sadly, Hardy nor Dauberman’s script seems to venture outside a standard parameter. The same with the actually story of Father Bichir and Sister Irene coming to the cursed Romanian covenant for their investigation. It’s pretty simply setup and doesn’t really go beyond the surface level, which could’ve easily benefited. Even the origins of Valak, while interesting, are handled in a clunky manner and aren’t given enough time to develop into anything substantial insight, which I would’ve liked to see. Perhaps all of these reasons derive from the fact that The Nun is actually the shortest of the five Conjuring Universe films (a runtime of being 96 minutes long). Yes, it makes for a breeze horror flick, but lacks the substance and allotted time to develop many of the narrative themes and story / character developments required for a well-rounded tale. Also, the horror moments of the movie, while naturally good and definitely have the “creepiness” that I was expecting (especially when Valak is on-screen), I was much more scared and overall “creeped out” when I saw The Conjuring and The Conjuring 2. As to be expected (especially with most modern horror flicks out there), The Nun also relies a bit too much on the whole “jump scares” tactic and not enough on something truly menacing and / or horrifying. Again, I was still scared, but not as nearly as not enough as I did during The Conjuring 2. Additionally, another problem with the movie is that it is setup (for tense and purposes) as a prequel installment, with the intention of interconnecting the events of the two Conjuring movies. Like most prequel endeavors, the story being told is a bit predictable as (for most part) as some of the film’s events (characters, narrative, macguffins, etc.) are usually carried over and you (the viewer) know of what will become of them. I think of it like this…. take the Star Wars prequel trilogy (Episode I, II, and III) …you know that Anakin Skywalker is not gonna die in those movies as he appears in the original trilogy as Darth Vader. See what I mean, it renders the whole “surprise” because the future story is already set, with prequel mostly showing the origins (or the story taking place before). Because of this notion, you (the viewer) for most part known that the overall defeat of “the Nun / Valak” in this movie is gonna be only temporary as the demonic creature returns to terrorize the Warrens (Ed and Lorraine) as well as the Hodgson family in The Conjuring 2. Thus, its bit rendered a bit redundant, but that’s mostly the “nature of the game” when it comes to prequel installments. 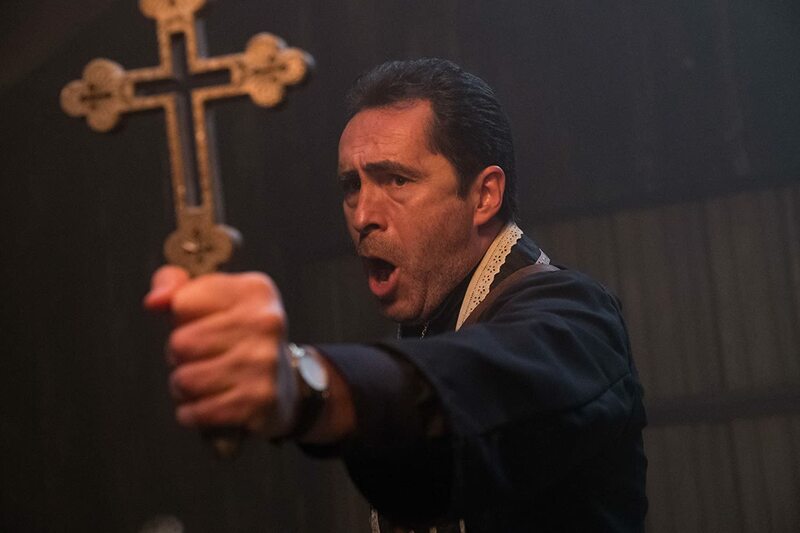 Also, as a side-note, while it’s pretty cool how Father Bichir and Sister Irene fight against Valak in the film’s final confrontation (in the third act), but it’s a bit odd that they don’t defeat the demonic creature from how it is in The Conjuring 2 (if you seen that movie you’ll know what I mean). I’m not asking much, but maybe a bit of continuity would be appreciated. The result of all of this makes The Nun an enjoyable, yet imperfect horror feature film. There’s fun and entertainment to it all, but the movie could’ve been so much more if the script and some of the film’s direction were both better executed and more refined. The cast in The Nun is relatively unknown (with a few recognizable faces here and there), but where the movie fails is in the characterization of these respective characters throughout the film. The many acting talents in the film are okay (i.e. not really good, but not really bad), but are hampered by the lacking in-depth insight into their personas and character development (as mentioned above). Perhaps who gets the most screen-time and is probably the most development character in the movie is actress Taissa Farmiga, who plays the character Sister Irene, a young novitiate of the Catholic faith. Known for her roles in 6 Years, Anna, and The Final Girls, Farmiga does a fairly good job in the roles, being the so-called “wide-eyed youth” that experiences such a dark and horrific event throughout. Her acting is fine (in the role), but her character isn’t as well-rounded as she should be. She has an interesting setup when she’s first introduced (i.e. a strong-willed / independent minded character), her character, more or less, devolves into the classic “girl in a horror” movie. That’s not to say Farmiga deliver a good job in the role, but much of her character (and her backstory) is quickly pushed to side in favor of narrative events. As a side note, Taissa Farmiga is the younger sister of Vera Farmiga, who plays the character Lorraine Warren in The Conjuring and The Conjuring 2. So, it’s kind of fun that Vera’s little sister is part of this largely connected horror movie universe. Behind Farmiga’s Sister Irene is the character of Father Burke, the seasoned / weary “miracle hunter” of the Catholic Church, who is played by actor Demián Bichir. Known for his roles in The Hateful Eight, A Better Life, and The Heat, Bichir does a certain charm about him in making Father Burke a likeable throughout the movie. However, his character development is pretty “blah”. He’s given a slightly tormented backstory arc that the movie shows, but never fully goes deep enough for us (the viewers) to wholeheartedly care about. Thus, despite Bichir’s acting talents, his character of Father Burke just simply comes to be a one-note character, which isn’t that quite great when he’s one of the main characters. Additionally, the platonic on-screen relationship between Bichir’s Burke and Farmiga’s Irene is okay and isn’t quite as dynamic as something like Wilson’s Ed and Farmiga’s (Vera) Lorraine’s screen presence in The Conjuring films. Last of the trio is the character of “Frenchie, a local in the nearby villages who lends a hand to Father Burke and Sister Irene investigation, who is played by actor Jonas Bloquet. Known for his roles in The Family, Elle, and 3 Days to Kill, Bloquet acts more of the “comedic relief” of the movie, having several hammy dialogue lines as the somewhat cocky yet good-natured Frenchie. Bloquet acting talents are okay, but his character is the least irrelevant of the main character and (to be honest) feels a bit “out of place” in various parts (i.e. being the comedic character of the group in a rather serious horror flick). The film’s namesake character of The Nun / Valak (or rather “Valak the Defiler, the Profane, the Marquis of Snake”) follows behind them and who is played by actress Bonnie Aarons. Known for her roles in And You Know Who You Are, The Fighter, and The Prince Diaries, Aarons continues to deliver a “bone-chilling” on-screen premise as the demonic Nun character. Like I mentioned above, while the make-up and costume efforts in bringing this character to life are highly commendable, Aaron’s performance (while not super dynamic) still provides enough “uneasiness” whenever her character is on-screen, which does add to the horror flavor throughout this cinematic universe. The rest of the cast is in more small supporting roles, filling in small pieces here and there or just simply in the background in various scenes. This includes several members of the covenant sister at St. Cârța Monastery like actress Ingrid Bisu (Outbound and Toni Edrmann) as Sister Oana, actress Charlotte Hope (Game of Thrones and The Theory of Everything) as Sister Victoria, actress Sandra Teles (Postman Pat and Deep State) as Sister Ruth, actress Ani Sava (Hot in Cleveland and To the Bone) as Sister Jessica, actress Gabrielle Downey (Burke and Hare and Me Before You) as The Abbess, and actress Lynnette Gaza (My Dark Days and The Taking) as Mother Superior as well as actor David Horovitch (The Young Victoria and The Infiltrator) as Cardinal Conroy, and actor Michael Smiley (Free Fire and The Lobster) as Bishop Pasquale. Again, while their acting talents are mostly good (no one really overacts or gives a bad performance), most of these characters are merely background / stock-like characters as the movie manly focuses on the characters of Father Burke, Sister Irene, Frenchie, and (by proximity) The Nun / Valak. 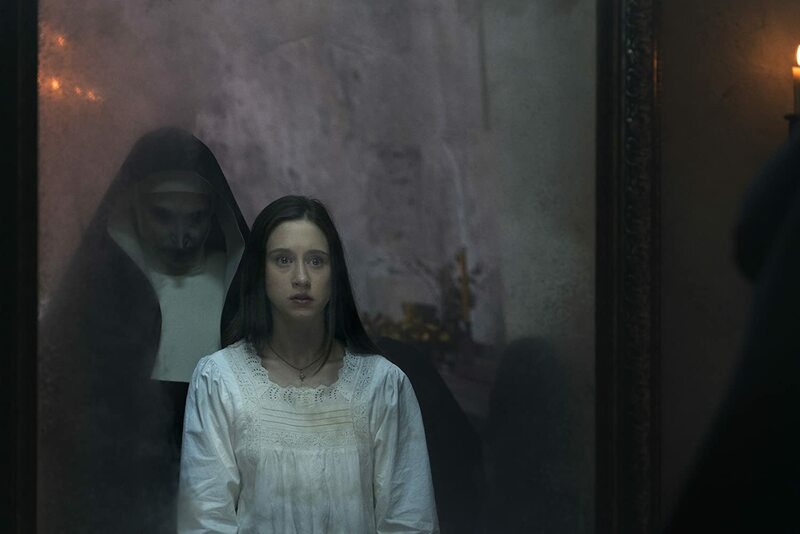 Father Burke and Sister Irene’s investigation into an unexpected murder at St. Cârța Monastery in Romania becomes a battle with the demonic presence of the spiritual entity known as Valak in the movie The Nun. Director Corin Hardy latest film sees the fifth installment of The Conjuring Universe return to the character of “The Nun”, revealing a bit more of her backstory in this prequel spin-off tale. While the movie does struggle with its thinly-sketched narrative and characters (as well as pacing structure), the film does standout with its atmospheric nuances (background and setting), it’s fun supernatural premise, semi-horrified moments, and giving one of the more truly scary character in The Conjuring films her own movie (i.e. The Nun / Valak). Personally, I kind of liked it (more than I was expecting to) and probably more than what many will think of it. Yes, while I agree it wasn’t as good as the two Conjuring movies (not really the “darkest chapter” as the trailer promised), the movie still succeeds in being a nice (and mostly satisfying) niche within this shared universe. Again, it’s not the greatest horror feature out there, but it’s actually a lot better than what I’ve seen (and heard) of recent movies of late. Thus, I would say that I would “recommend” this movie, to both causal moviegoers (the film can stand out its own as well as those who like The Conjuring / Annabelle features as well). 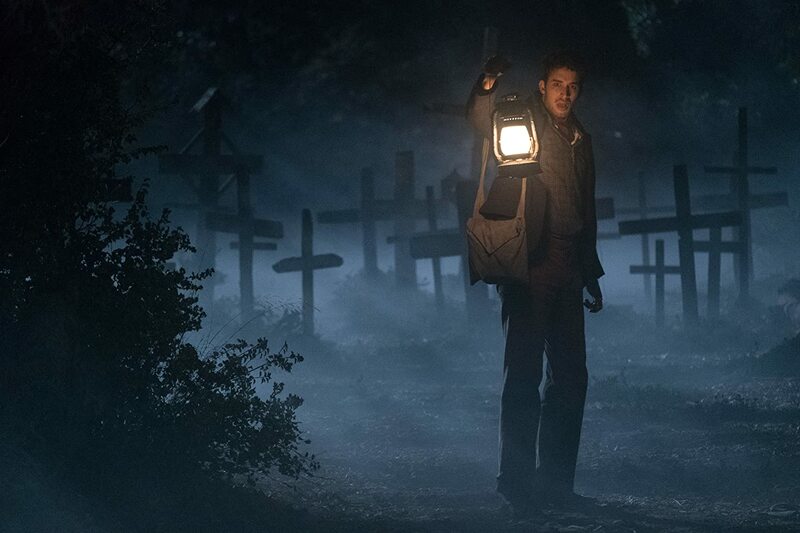 In the end, it seems like The Conjuring Universe continues to grow and expand (a third entry in The Conjuring and Annabelle movies are in the works as well as a rumored “The Crooked Man” film as well), The Nun ultimately provides enough creepy / atmospheric horror elements to be a perfectly serviceable (yet imperfect) horror flick and nice addition to this already establish cinematic world of paranormal / demonic spirits and supernatural entities. God ends here…so does your enjoyment. Haha…well since I’m not a huge fan of The Conjuring movies, I actually did quite enjoy the movie. Like I said, it wasn’t the greatest, but (to me) it did have its moments.